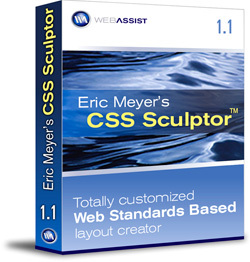 CSS guru Eric Meyer, in collaboration with WebAssist, has released CSS Sculptor for Dreamweaver. This easy-to-use extension makes creating CSS layouts in Dreamweaver a snap. The last two releases of Dreamweaver included CSS templates; however, users needed an in-depth knowledge of CSS to modify the layouts. Enter CSS Sculptor! This template-based application makes it easier for both designers and programmers to quickly design CSS layout. It’s easy to install this extension using the Manage Extension Command in Dreamweaver, and then the application is launched by choosing File>New CSS Sculptor Page. The interface contains six tabs: Layout, Box, Type, Design, Print, and Output. Each tab’s screen contains controls for customizing the look of the final page. Layout (the first tab) contains 41 different CSS layouts, including one-, two-, and three-column static, elastic, fluid, fixed, and hybrid layouts with optional header and footers. Users can select from the included color schemes or create their own. The ability to customize almost all aspects of a layout from margins and padding to borders and colors is a welcome attribute. I am not sure if I agree that CSS sculptor is easy to use. Yes it does generate nice CSS mark up. I find it easier to customize the layouts directly in the CSS style sheet or use Dreamweaver CSS panels than using the interface to make changes. Yes, CSS sculptor interface would have been nice to have in the Dreamweaver 8 days. CSS sculptor as a good set of proven building boxes to design a site (time saver), I give it thumbs up. Using CSS sculptor to modify the CSS default values, thumbs down; it needs improvement.